A new species of frog has been found living in Staten Island, New York City, say US scientists. 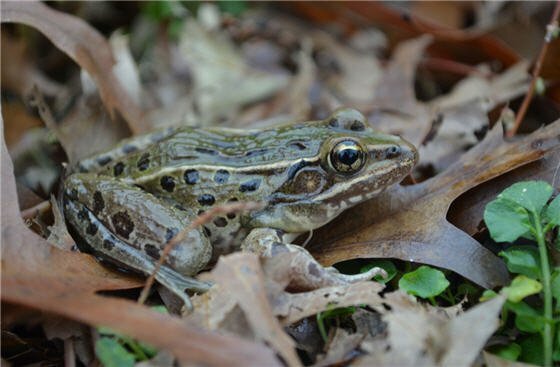 While new species are usually discovered in remote regions, this so-far unnamed type of leopard frog was first heard croaking on Staten Island. Jeremy Feinberg of Rutgers University in New Jersey noticed the frogs there had a call he had never heard before. They look identical to other species, but genetic analysis showed they are a new species of leopard frog that probably once lived in Manhattan. While studying leopard frogs Jeremy Feinberg noticed that instead of the long “snore” he was expecting, he heard a short, repetitive croak. “When I first heard these frogs calling, it was so different, I knew something was very off,” Jeremy Feinberg said. The frogs are currently found in Staten Island, mainland New York, and New Jersey, sometimes in sight of the Statue of Liberty. By analyzing their current range of habitats the scientists believe they would have lived all over New York, with the centre of their population at the Yankees Stadium on the Bronx, to the north of Manhattan itself. The research by scientists at the University of California, Rutgers, UC Davis and the University of Alabama has been published online in the journal Molecular Phylogenetics and Evolution. “For a new species to go unrecognized for all this time in this area is amazing,” said Professor Brad Shaffer, one of the authors from the University of California Los Angeles. “Many amphibians are secretive and can be very hard to find, but these frogs are pretty obvious, out-there animals,” Prof. Brad Shaffer said. There are more than a dozen species of leopard frog found from Canada to Central America.